Dust Bunnies, scary? Who knew? I may have just found the perfect excuse to quit cleaning under the beds! Revenge of the Dust Bunnies was a delightful read with just enough silliness to keep it from being too scary. The chapters are short enough for the younger reader (2nd or 3rd grade) but still enjoyable for the slightly older reader (about 6th grade). My daughter is 12 and in 6th grade and she loved it! She wants to read the next one when it comes out and I look forward to the next one as well. I love it when my child finds a book or a series that they truly enjoy. I received a free copy of Revenge of the Dust Bunnies in exchange for an honest review and it was a joy to read. Firstly, I received this books as a First-reads Goodreads Winner! Thank you to both Goodreads and Mr. Kalmbach for allowing me to read this book. As this book is meant for a very young audience, reading level 4, I had my son at the time 8 years of age and my daughter 14 years of age read this as well. Son 8 years old: It's a good book and funny.Daughter 14: It was ok, short. So that's that. The book itself was a good story, it almost reminded me of something you may tell around a campfire. It was a little odd as some of the characters (as well as the world) seem to die, one in the first few pages. So if you want to protect your kids from at worst a body being slammed into a car and then killed then I'd not suggest this one. Overall it's a kids book, I saw previous reviews stating that it was like the Goosebumps series, I can't personally say I agree as it just simply wasn't even in the same reading level. There just simply wasn't enough story here to comment on things like character development and big plot twists. I must say the use of Latin in the book did stimulate a conversation and further research on the kids part.So thank you very much for letting us read this and we hope that perhaps we can read Mr. Kalmbach's works for higher ages in the future. I received this book as a goodreads first-read giveaway.“Revenge of the Dust Bunnies” is an very quick read (30 pages or so) but manages to provide a fast paced and interesting storyline that is suited for children from year 4 to year 6. It's story about giant world dominating Dust Bunnies is especially suited for boys who are reluctant readers.Yes it has the potential to be quite scary for some of the younger readers, but there is something just amusing enough about the thought of a talking giant Dust Bunny that helps buffer the scare factor.Reminiscent of the Goosebumps series that is still popular today, I would feel quite happy to recommend this book to age appropriate students who visit the Junior School Library that I work in.Might have to increase my dusting regime at home though – those dust build ups in the corner have got me a bit worried!!. "Revenge of the Dust Bunnies" is a perfect spooky bedtime snack for the 3rd-6th grade crowd. In a nutshell: a trio of teens unravel a murder mystery of apocalyptic proportions. Author Mike Kalmbach delivers a quirky--and scary--take on an age old problem: dust bunnies. I live in a three-pet household. Despite my best efforts with a vacuum cleaner, dust bunnies proliferate at a staggering rate, swirling around my stairs and baseboards. Now I know the real reason!! I'm feeling the need to clean again...before they get me! After reading this tale, you'll never think of them the same way. Looking forward to the next installment in the Spooky Snacks series.Note: I received a free copy in exchange for a review (and I loved it). I enjoyed the Goosebumps book series when I was a kid, and Kalmbach is capturing the fun, spooky flavor of that series in his new book, “Revenge of the Dust Bunnies.” Kids grades 3-6 will love this quick read because it is fast paced, intense, and highlighted with quirky illustrations. Parents will love it too, because it has a good moral to emphasize to their little ones: get rid of those dust bunnies before they have a chance to get rid of you! Looking forward to reading more of Kalmbach’s future ‘Spooky Snacks.’ Note: I received a free copy of this story in exchange for an honest review. 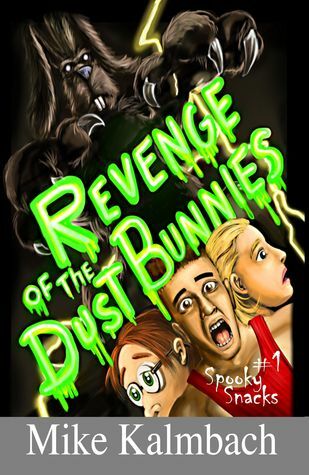 Revenge of the Dust Bunnies is a fast-paced read that reminds me of the Goosebumps books. It’s quirky and spooky, packed with kid appeal. The title of the series, Spooky Snacks, is right on target. A quick, entertaining read, it’s more like a snack, but one that will leave a bad taste for dust bunnies forever after! I’m afraid to look under the bed now, especially after reading the true scientific facts about dust bunnies the author added in the back of the book. Dust bunnies aren’t so cute and innocent, after all. Dust bunnies always seemed like such timid little critters. Who knew? Well, when you get them all together, they just turn into another mob mentality. I guess I can't really blame them.Revenge of the Dust Bunnies is a wickedly fun tale for the kidlets and warped adults (guilty), alike ~ and if you survive, there are games to play at the end. What a fun, scary read for 4th to 6th graders. I remember when I was the targeted age (a million years ago). I LOVED reading this kind of book. The illustrations are really good and spooky, too. Kids will love it! I received this book for free through Goodreads First Reads. Thank you.I loved this book. It was a scary quick read. It reminded me of Goosebumps books. I hope there will be more books in this series. I would love to read them. I definitely recommend this book. Fun, kitschy, exciting read for any child. The book is aimed at elementary aged readers and is perfect for that age. Enjoyed the story, thoroughly and the art work is fun, too. As a teacher - I will be including this book in my personal school library. Short and to the point! With a big twist to the ending. Maybe I'm just an old fogy, but I didn't think this was appropriate for kids. It wasn't "fun" like Monsters, Inc. or something...the kids are killed. Sounds crazy, but it was almost realistic. I can see it giving kids nightmares. Kids tend to be afraid of underneath a bed...while something like Monsters, Inc. makes it seem silly, this book makes it seem a real fear. I bought the book for my granddaughters, but am giving it to their father instead...more appropriate for his age level! Clever title, clever idea, but I didn't like how it was carried out. My ten-year-old son finished reading this book last night.He rates it "ten stars out of five stars. "He has one question for the author: "When are you going to write the next book in the series?" (because he can't wait to read it)For reference, my son's interest in reading ranges from comic books to The Hobbit. Highly entertaining, a perfect read for teens. It has a lot of humor. Check out Revenge of the Dust Bunnies, exclusively on Amazon. http://www.amazon.com/Revenge-Bunnies...Enjoy! This was hilarious! Great horror story for kids or people with dust allergies.